Indulge in the elegant beauty of Chocolate by Petite Le Vian. 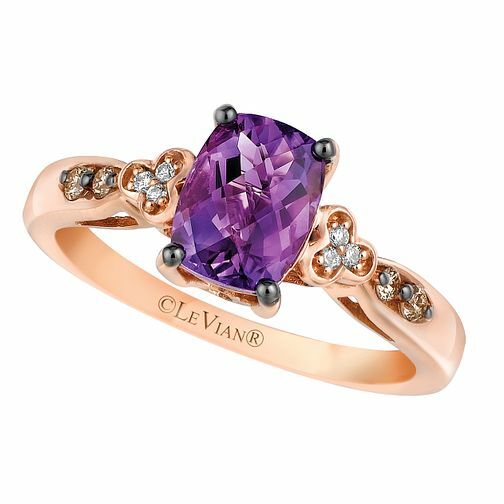 With a vivid rectangular Grape Amethyst at its centre, this stunning ring is crafted from sumptuous 14ct Strawberry Gold and set with deliciously dazzling Chocolate and Vanilla Diamonds along the shoulders for breathtaking beauty and unique, glamorous style. 14ct Strawberry Gold Grape Amethyst & Diamond Ring is rated 5.0 out of 5 by 5. Rated 5 out of 5 by Anonymous from Beautiful ring The mid-purple colour of the amethyst looks great with the tiny chocolate and vanilla diamonds along the shoulders - the rose gold metal also complements the amethyst colour beautifully. Rated 5 out of 5 by Anonymous from Beautiful colour This was given to me as an engagement ring. The ring is beautiful and the stone such a rich colour. I frequently get compliments on it.